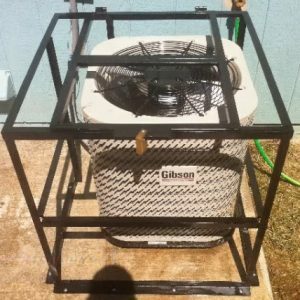 Securing an air conditioner with a security cage kit is something many need done to help prevent an A/C unit from being stolen or vandalized. Security kits come in all shapes and sizes and can even be built by someone with welding skills. Most kits uses metal bars to prevent theft while more secure units combine a metal mesh screen for added protection. Securing a unit with a metal cage is good at preventing theft but vandalism can still occur. For more security units can be covered in a steel cage with a metal mesh wrapped around the unit. This can be good in scenarios when a unit is located close to a busy street or sidewalk. The type of cage needed will need to be thought out with each location being different. The first step before buying a security cage is to measure the units dimensions. 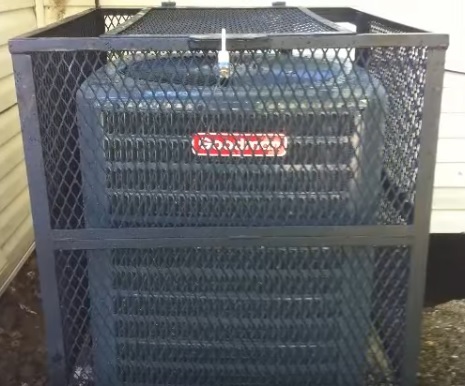 After the dimensions are had a cage that will fit around the A/C unit can be bought. 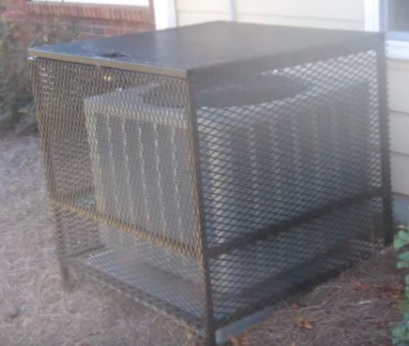 Air conditioning Security Cages can be bought at many locations or online on Amazon or elsewhere. If you have some skill welding building your own cage is also a good option. Building your own cage will require some skill but can be a real cost saver. Most all cages are bolted to a cement pad but they can also have the legs placed in the ground and cemented in place. The idea is to make sure the cage is mounted well enough that it will be difficult to remove. If you build a unit yourself it is a good idea to weld the thread on any bolts so a potential thief will not be able to unbolt the assembly. 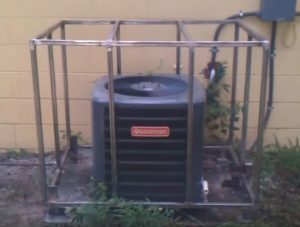 Security cages are also available for Window A/C and Mini split units. Whichever route is taken building a cage or buying one can go a long way in helping to prevent theft and vandalism of a HVAC unit.